Several months ago I was contacted by Jocelyn Green to review a book she co-authored. Veteran’s Day is the perfect day to talk about this book, because of the stories it holds. I hope you get a chance to read this or win a copy below. In the Tradition of the “Chicken Soup for the Soul” books, Battlefields & Blessings is a book full of short stories. Stories about courage, faith, and miracles. Stories about heroes, people who did their duty to serve God and their country. 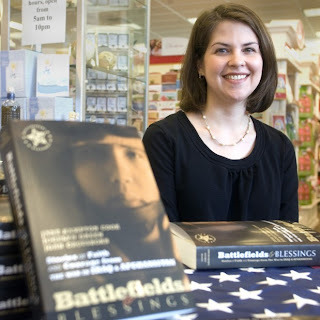 Stories from soldiers, chaplains, military wives and more. Stories that will break your heart, but also lift it up. Through this book, you will get a glimpse into the eyes of the people who serve our country, the men and women who have laid their lives down for our freedom, and the people who are living in danger every day while we are at home going about our business. You will see just a little bit of how they live, how they survive and how they get through each day. You will see how God has protected and watched over them, and brought them safely home. I was so blessed to be able to read this book and learn about the lives of those who fight for our freedom. Being a military wife, it hits home for me because I know of the sacrifices military families make. This book has 365 short stories, one for each day of the year if you want to read them that way. There are verses in the side margins to go with each reading and also a prayer for each day. I know that if you read this you will be as blessed as I was to learn about these heroes, these men and woman who have fought and died for our freedom. Prayer: Lord, help me not base my confidence on my own understanding when I should be trusting you instead. Jocelyn Green at a book signing. To win this book, please leave a comment with why you think this would be a good book to read. 1. Post about this giveaway on facebook or twitter. 2. Click here to become a fan of my blog on facebook, Singing Through the Rain or if you already or let me know that you are. 3. Post about this giveaway on your blog with this button or post this button on your sidebar. I think book would be great to read because it would help me better understand what my husband goes through during deployment. We've completed one deployment and are heading for another – sounds like a great book to help me get through more rough times! Kathryn, thanks so much for the review (and posting an excerpt and the video clip!). I'm so glad you enjoyed the book. Good luck to all who enter the drawing! i found your blog on Content is King through SITS..i love it! i am a new follower..good luck on the Key Spouse thing!! I found your blog through the SITS linky and joined through GFC. 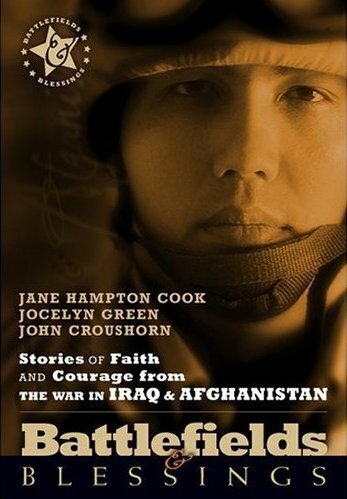 I'd love to win this book because it's always encouraging to read about faith and the military. Some of my former students are in the military and maybe this book would help me as I pray for them. Blessings! +1 bonus to help me in the drawing–I added the button advertising this giveaway to my sidebar! +1 bonus entry–I "liked" your blog's facebook page! I think this book would be a great read because faith is so important to the morale of those serving for us. Also, my son is in military school and I think that this book would tie faith and military service together for him. Oh, wow. I might have to order a copy. Thank for posting a review, it looks like a great book! Sorry I missed this post! I enjoy these kinds of books. Will link over to the author's site. Would you be interested in reviewing a book of devotionals on Proverbs? Here is a link with info about it: http://warrenbaldwinbiblefountain.blogspot.com/search/label/Roaring%20Lions (This not my main blog, but one where I post article more related to Bible studies). If you are interested, I'll send you a copy.